A low, scapose, smooth plant, 5 to 10 inches high from a small bulb, stem bearing one to three loose sheathing bracts on the stem and a single linear leaf hidden at first in the upper bract and developing after the flower has faded. 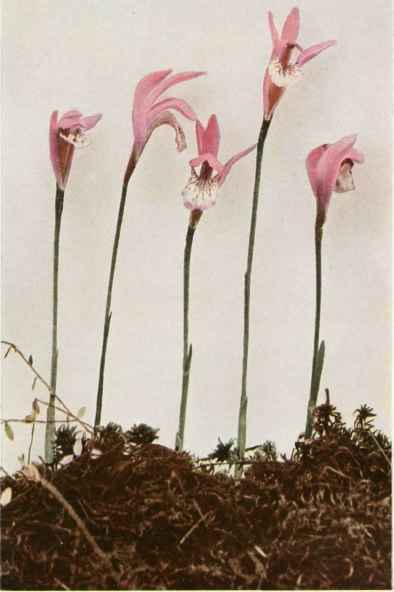 The single flower arising at the top of the stem from between a pair of small unequal scales, rose-purple, 1 to 2 inches high; sepals and petals similar, linear to elliptic in shape, obtuse, connivent, hooded, and arching over the column; lip usually drooping beneath the sepals and petals, the apex broad, variegated with purplish blotches and crested down the face with three hairy ridges, the margin fringed or toothed. Capsule about 1 inch long, ellipsoid, strongly six-ribbed. In bogs, low meadows and mossy depressions or moist thickets, Newfoundland to Ontario and Minnesota, South Carolina and Indiana. Flowering in May and June. One of the most dainty and beautiful of our native orchids.